From the introduction: This is a medical handbook - with a difference. The title of this book is basically self explanatory; The Novel Cure is a reference book giving different novels for that will cure or alleviate different ailments, whether physical or emotional. From the given summary: "To create this apothecary, the authors have trawled two thousand years of literature for novels that effectively promote happiness, health, and sanity, written by brilliant minds who knew what it meant to be human and wrote their life lessons into their fiction. Structured like a reference book, readers simply look up their ailment, be it agoraphobia, boredom, or a midlife crisis, and are given a novel to read as the antidote. Bibliotherapy does not discriminate between pains of the body and pains of the head (or heart)." It's pretty straightforward, and quite an amusing idea. I was quite surprised by the sheer number of books featured in this volume that I had never even heard of, never mind read. 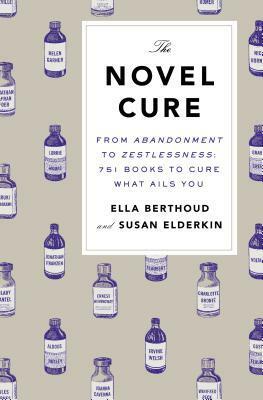 The Novel Cure reminded me of just how many (possibly) good novels are out there, and of how one has to be selective in reading, because there will never be enough time to read every halfway interesting book. I got quite a few reading suggestions from The Novel Cure, whether or not I suffered from the specific ailment it was prescribed for. I also bookmarked helpful entries, maladies that I either suffer from or may suffer from in the future (for example, adolescence). Some of their choices seemed a bit dubious to me, but others were spot on. I have yet to try any of the cures, but I look forward to doing so in the future. The authors also explained their choices fairly well - sometimes their cures are novels that offer solace and a portrayal of a character in similar predicament. Sometimes their novel solutions reflect a model to which the reader should look up to. And sometimes novels provide the opposite: characters you most definitely don't want to resemble. I haven't actually read the book cover to cover yet; I stopped around the R's. It's not exactly a book to read like that; it's a book to use as a guide, looking up your ailment, or just simply to get recommendations if you're in a certain mood. It's a book to be savored and bookmarked. I suppose the premise is a bit gimmicky, but I enjoyed perusing the book, and am glad to have it as part of my collection. You will be too. Disclosure: I received a review copy from the Penguin Press. Hi Cleo! I also got sent this for review, and thought it was such a clever little idea! I have yet to put it to use, but what a great gift idea it would make for any book-lover out there. Or better yet, someone who's looking into picking up the fantastic habit of reading ;). Thanks! Yes, I thought it was such a _novel_ idea. ;) I also really liked the cures for "reading habits" and maladies relating to reading (such as having too many books; I definitely suffer from that). They were quite useful and amusing.